VeryPDF PDF Commenter is certainly an easy-to-use application created for you to comment your PDF files. PDF Commenter gives enough functions to allow you freely publish your individual remarks for the PDF document and share the feedback with other peoples. Furthermore, it supplies an extremely useful way for you personally to incorporate contents or change the text or include text in any font you like, specially in filling out digital types, proper spelling mistakes, delete words totally and so on. You might be ready to help save, move, duplicate, paste and print the feedback and contents. Convert PDF format files to Text files, BMP files, TIFF files, GIF files and so on. VeryPDF PDF Commenter lets the customer open any PDF file which contain comments, employing the several tools (Pen, Line, Text Box, Notes, Stamp, Rectangle, and others), straight around the PDF file's pages. The commented paperwork can then be saved directly back again to PDF format. With this particular way, any people can go through or print the commented PDF paperwork. Commented documents could also be quickly email and share to other peoples. With VeryPDF PDF Remarks, Commenter may also import the comments from an external file, this can be done easily. PDF Remarks enables commenting of PDF files with a few steps. A PDF file obtained for evaluation may be opened in PDF Commenter, commented with user's feedback, then saved back again to original PDF file. This will save user's time and money. Together with the VeryPDF PDF Commenter, a PDF document is dealt with considerably like a regular printed document. The individual just writes or attracts his suggestions and ideas around the current document. 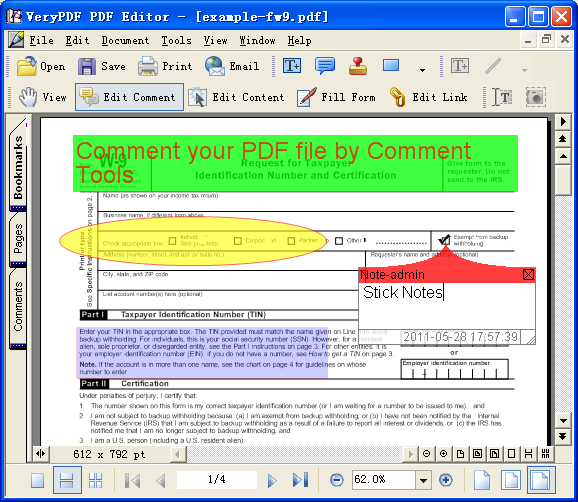 VeryPDF PDF Commenter can comment a PDF File with robust commenting tools, it edit PDF files by "Edit Comment", "Edit Content", "Edit Hyperlinks", "Fill Forms", etc. functions, it will comment PDF files utilizing the Pen, Line, Text Box, Rectangle, Stamp, Filling color, etc. drawing tools. VeryPDF PDF Commenter is made up with the capacity to incorporate, delete and conserve remarks straight inside the PDF file. Include "sticky note" feedback or highlight, strikeout and underline text. All comment types possess a pop-up comment window into which it really is achievable to type additional data. All Commenter inside a PDF document may be detailed and sorted by page range, users can import and export feedback easily. Whether or not you're a firm person who specifications a simple remedy for editing and modifying PDF files, or an entrepreneur who desires to correct the spell mistakes, VeryPDF PDF Commenter has the functions which you need. VeryPDF PDF Remarks is easy to use, after you installed it into your system, you can run it and open your PDF document for commenting. If you want to edit contents, just click on on "Edit Contents" button. If you would like to edit comments, just click on on "Edit Comments" button. Use familiar markup tools, such as sticky notes, highlighting and drawings. Add annotations to documents that can be removed without affecting the document contents. Summarize comments and view them on paper. Easily reply to comments, or review the replies of others. Consolidate comments from multiple reviewers into a single file. Share comments with Acrobat and Adobe Reader users. The comments which added by PDF Commenter are 100% compatible with Adobe Acrobat. You can re-arrange all comments in Comments List panel.